Your anniversary is the celebration of the day you promised to love and honor each other for the rest of your lives. Every moment of this special day should be special. Of course, you can start the day with a special breakfast, but both of you work different shifts, so that won't work. The same applies to dinner, so instead, you've decided to throw an anniversary party and invite plenty of friends. Why not add confetti cannons to the party? 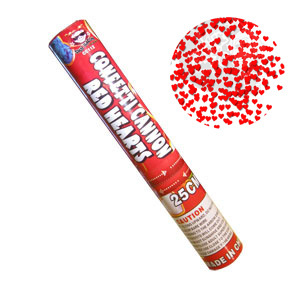 Our red hearts confetti cannons are a very popular choice for anniversary celebrations. Giving each of your guests a party confetti cannon at their place setting is a great way to set the tempo of the party. Whether you have been married for one year or 50 years, your anniversary celebration should be memorable. You need good food, great music, a place to dance, and of course a ton of our red hearts confetti cannons for your guests to shower the happy couple and themselves in a seemingly endless shower of completely harmless but incredibly beautiful red hearts. Our confetti cannons measure 10 inches long and 1.5 inches in diameter. They are extremely easy to use, you simply hold the long part of the tube and twist the smaller part on the bottom. A simple twist and boom, massive showers of red hearts flying up to 10 feet in the air. The best part is, these are not pyrotechnic devices; they are operated by compressed air and do not produce any heat or smoke. How About a Surprise Party Instead? Your best friends are celebrating their 25th anniversary next month and you're planning a surprise party for them. Let's take a look at your checklist, caterers – check, facility – check, guest invitations – check, party balloons – check. But wait, there is one more fantastic item yet to be added to your checklist. Something special that is going to add even more fun to the party. We're talking about our red hearts confetti cannons. There are a couple of different ways you can make the most of a party confetti cannon. For example, if you are planning a fun-filled, lights-off surprise party, you could present each of your guests with a confetti cannon. Then at the moment the lights come on and everyone is shouting "Happy Anniversary!" you can all shower the happy couple in glorious red hearts. Not quite what you had in mind? Why not save the confetti cannons until the guests of honor step out onto the dance floor just as they did on their wedding day? When the music starts, have the guests take out their red hearts confetti cannons and cover the couple with an endless shower of red hearts made from biodegradable materials. This is just a small sample of the many things you can do to add more fun to your next wedding anniversary celebration. Visit us at Wedding Sparklers Outlet to see our entire selection of confetti cannons for your every party need.